Conventionally, grinding machines consist of a power driven grinding wheel and a bed with a fixture for guiding and holding the workpiece. The required speed of the wheel is actually determined by the manufacturer’s rating and wheel diameter. Thus, the speed can be specifies according to the requirements of the grinding operation. The grinding machine is an important tool in the manufacturing industry, most specifically the metalworking industry. This machine is used in removing material from the workpiece by abrasion. To achieve the grinding process, various components are used, although generally, an abrasive wheel is used to perform the grinding process. There are many types of grinding machines. Some of these include the surface grinder, cylindrical grinder, bench grinder, belt grinder, tool and cutter grinder, jig grinder, and gear grinder. The surface grinder includes the wash grinder. This grinding machine has a head which is lowered to the workpiece, as the workpiece moves back and forth past the grinding wheel. The workpiece is held in place by a permanent magnet which is used with a magnetic stock. The cylindrical grinder includes the centerless grinder. This grinding machine may have multiple grinding wheels for multiple grinding operations. With this type of grinder, the workpiece rotated and is fed past the wheel. This grinding machine is most ideal for the fabrication of precision rods. The bench grinder has two wheels which are of different grain sizes. This grinding machine has two different grain sizes for roughing and finishing operations respectively. The bench grinder is used for shaping tool bits and repairing various tools as well. The belt grinder is the most common type of grinding machine used in processing metals and other materials. This grinding machine is very versatile and can perform operations such as finishing, deburring, and stock removal. The tool and cuter grinder is also known as the D-bit grinder. This grinding machine performs the minor function of a drill bit grinder, and other specialist toolroom grinding operations. 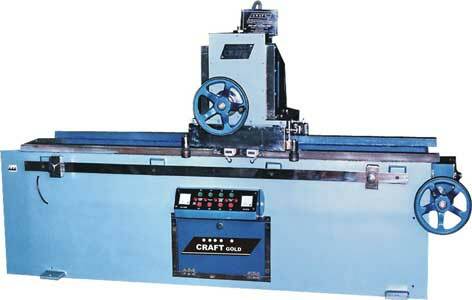 The jig grinder is most widely used for finishing jigs, dies, and fixtures. This grinding machine is used primarily in grinding holes and pins, but it can also be used for surface grinding to finish work that is started from a milling machine. Finally, the gear grinder is used as the final machining tool in the manufacture of high precision gears. This machine removes the remaining thousandths of an inch of material that is left by other manufacturing methods.